Lewis Vaughn, an author, philosopher and critical thinker whose specialty is bioethics (the ethics of medical and biological research), needed help. After publishing more than twenty nonfiction books, many of them addressing big, heady topics, like Living Philosophy: A Historical Introduction to Philosophical Ideas, he contacted me sixteen months ago for help writing a memoir. Reaching readers with his personal story and making it more than a narrative “think piece” was a high mountain to climb. Barefoot. 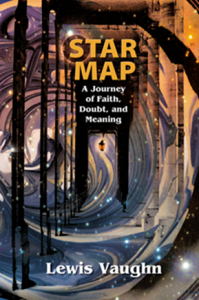 Today, Lewis celebrates publication of his acclaimed first memoir, Star Map: A Journey of Faith, Doubt and Meaning. To give you an idea of what I do as a memoir consultant and developmental editor, I’ll share some about the path I helped this author take to complete his memoir and have it published. To start, I read Lewis’s full-length manuscript. He had written about his journey from being a passionately fundamentalist Christian young boy to becoming a questioning and somewhat disillusioned young man who ultimately finds peace with his questions and his broader understanding. His writing showed skill, with well-articulated thoughts, but the tone was almost academic, which doesn’t fit memoir. Memoir wants a personal tone; readers want to feel spoken to, up close and intimate. Lewis presented many thought-provoking ideas, but the book needed scenes interwoven with his narrative to animate and engage readers in his transformative journey from believer to questioner. Scenes portray “real time”; they draw readers in and allow the writer to give characters depth through the use of relevant dialog, characteristic mannerisms, and actions that add while also moving the story forward. Next, like I do with all memoirs in progress, I evaluated the story’s shape—where it begins, how it progresses, where it finishes. I considered how characters come across—are they flat (only a name and a relationship to the writer, like Uncle Harry) or are they dimensional? I gave suggestions for fleshing out key characters and suggestions for where scenes could illustrate in place of narrative summary. I also encouraged this author to explore the emotional truths he’d uncovered, not just the facts. A few weeks after he received my consultation notes, Lewis presented me with a revised draft, ready for editing. After a few months of hard work on both of our parts, Lewis’s book was finished and he was ready to find a publisher. One year later, his memoir, Star Map, is published and receiving stellar reviews. For any good memoir, whether you’re a new writer or an experienced one you need to step out and be brave, remembering your story has value, you need to learn what you need to know about good memoir writing, get expert help along the way, and know that all writers benefit when they ask for guidance crossing that bridge between nonfiction and fiction to write creative nonfiction—resulting in a memoir readers can learn from and enjoy.